Not content with building an empire on music players, they had to get into phones. Not content with redefining the mobile phone market, they had to get into personal computers (real ones, tablets). Not content with disrupting computing, they had to get into the interface market (hello, Siri). Not content with the interface market they had to get into healthcare. Apple, you see, is now offering healthcare services to its staff because a: it has to soak up all that unpaid tax and prove it's a good corporate citizen somehow and b: the US healthcare system is so broken that even a sitting Vice President considers selling his house to pay for medical bills. Apple has teamed up with Amazon, Berkshire Hathaway and JPMorgan Chase to offer healthcare services to their employees and while from this distance that seems like so much "meh", to the US health insurance market it has sounded the alarm bells like nothing before it. To have the companies responsible for so much disruption come to their neck of the woods, even in so mild a way as an employee health scheme, sent shares in large US health schemes plummeting. Of course, for the rest of the First World (New Zealand included) such schemes aren't necessary because of our communist leanings and willingness to pay for each other's health care (editor's note: I have argued about this online many times with Americans who cannot believe I don't estimate and begrudge every penny spent on healthcare) but what Apple and Amazon do in the US seems destined to percolate throughout the rest of the world as well, albeit in other forms. And so we should expect to read more about the move into healthcare in the future. In fact, why wait. Look, Apple's just signed a deal to update its health records capability in the iOS app and is partnering with a US-based health records company that isn't New Zealand's Orion Health. The moral of the story: all your records are belong to us (kids, if you don't understand this meme, ask your grandparents). I'm a bit fit but I don't have a personal step tracking thing, mostly because I gave up wearing watches a while ago (they get in the way when you're touch typing I find) and partly because the kids got stuck in to measuring their steps and spent their money on a couple and now that's their domain. But I shall have to get a bit closer and have a look at the settings because by the looks of it, these devices work exactly as they're intended. (Editor's note: I've always wanted to do the italics thing at the end of the line. It's so very Lovecraftian. But I digress). Fitbits are good for tracking your steps, tracking your fitness, tracking your location. 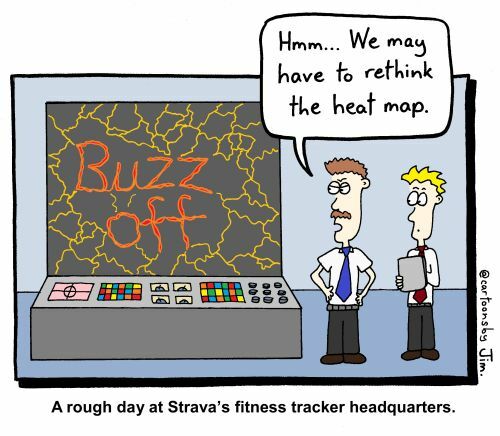 They're designed to be a cheap and easy way for runners or cyclists or any of those other sporty people who get out to map their path, track their effort and so gamify staying fit. The key word in all of this is "track" because of course they're designed to track your location. That's what they do. Being surprised that they track and then share that location is a bit redundant. It's like complaining when you burn your arm on the stove top. It's supposed to be hot. I suspect where the trouble started is in the gamification process. By turning these efforts into achievements and then pitting user against user, these devices took the whole tracking thing one step further than many expected. So, instead of Annie and Brian in the office pitting their distance and effort against each other, we have Captain Chuck and PFC Dave out on operations in the desert jogging around the base inadvertently yet deliberately revealing their location. While we can have fun at the idea of security personnel being so insecure, there's something more serious at stake. These devices worked as they're supposed to but not as users expected and we're likely to see a lot more of that as we get into the Internet of Things (IoT) and of course the home automation market. "What do you mean, my voice-activated speaker is listening to everything I say?" Well, that's what it's for. You've planted an all-seeing, all-listening bug in your own living room and did so deliberately. That the Amazon or Google or Apple device hears everything you say or do shouldn't be a surprise to anyone, but I bet we'll have a few jittery cases before we're done. And so we should. What rules govern these services? Who decides what happens to the data? Do users know that the devices will figure out what time everyone gets up, what time everyone goes to bed, what kind of products they order between 8pm and 8.15 and so on? All that is yet to be decided but, as is our way, it's likely to be decided after we've all gone out and bought one. Sorry, "after we've all gone out and bought one." The darling of the New Zealand stock exchange, Xero, has departed our shores preferring to delist from the NZX and have a single listing in Australia. The reasons given, access to a larger pool of capital, a broader range of investors and better analyst and broker coverage, should send shivers down the spines of both the yet-to-be-appointed national CTO and the Minister of Economic Development, because it is a clear indictment of the New Zealand financial markets and their inability to invest in technology companies. The future of New Zealand's economy needs a second and third string to its bow and digital/high tech companies should be a major part of that growth, but there's no point developing really good IT ideas locally if you can't get the funding you need to grow the business. Just look at PowerbyProxi - a local company with a great idea (wireless charging for any device that uses batteries) that tried to list locally a few years ago but ended up being unable to attract the right investment. Last year it was bought outright by Apple for an undisclosed sum, rumoured to be around $90 million. All that IP, all that potential, all that opportunity now owned by a large international player instead of by a local developer. We need to resolve this and soon. It's still far easier to invest in the local housing market and become a landlord than it is to invest in the sharemarket, let alone a tech company. That needs to be high on any economic development agenda.